I had a bit of a mini holiday on the weekend. I took Monday off to enjoy myself lazying around the house. It was a rather successful lazy event. I only did some light reading that watched the end of Tudors, something I had been meaning to do for quite a few years. So, I thought I would kick off the week with an interview. Cullen Bunn is no stranger to comics and his career has taken him from Marvel's Deadpool to all the places where the most unique comics live like Oni Press and Boom Studios! Recently we were creeped out with The Empty Man and made to laugh by Return of the Living Deadpool! On March 11th Oni Press will debut Bunn's new series Hellbreak. I had to talk to him about this exciting new book. Lucky you, you get to read it! 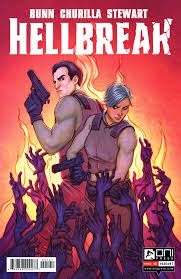 TFQ: Hellbreak has been described as one part Aliens, one part Dante's Inferno and one part Inception. How did you come up with this story!? Cullen: That’s not a bad description of the story. I think it might skew a little more Dante’s Inferno and the Dirty Dozen, but I could see a bit of Inception (and a lot of Aliens) in there. I came up with this story a while ago, actually. I guess it grew from my desire to tell a rip-roaring action story with heavy supernatural overtones. I didn’t want the lead characters to be magical or superhuman in nature. Quite the opposite. I wanted them to be regular people (or at least regular hard cases) who were facing lethal supernatural threats. 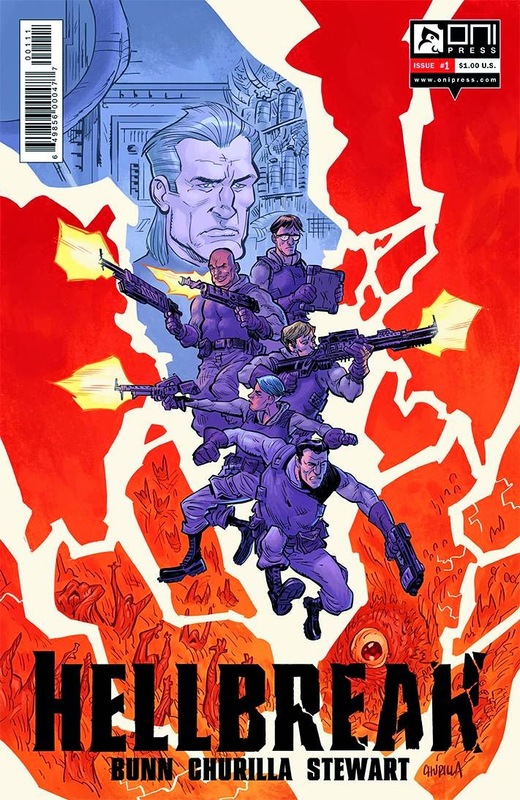 The idea changed a little bit over time, but the core element has remained the same—a crack team of soldiers venture into Hell to rescue lost souls. TFQ: What brought you together with Brian Churilla on this release? Cullen: I’ve been in contact with Brian for a long while, and I’ve always wanted to work with him. He did the 5-issue series THE SIXTH GUN: SOINS OF THE GUN a little while back. Oni suggested him for this title, and I was thrilled to be working with him. TFQ: Your recent series The Empty Man has just ended. A lot of the stories you write are very dark and hint at a world behind our own. Can you tell us a little bit about why you gravitate to the darker tones? Cullen: I’m not sure why I tend to stray into dark territory. I guess I’m just messed up somehow. I’ve been drawn to horror and dark fantasy since I was a kid. I think the darker, meaner, more twisted stories have a better chance of taking the reader off guard and surprising them. I also think fear and horror is a great background before which to play with the entire emotional spectrum. TFQ: What inspires your stories? Do you find inspiration in other comics? Cullen: I definitely read a lot of comics, but I find inspiration in novels, short stories, and movies. I pull a lot of ideas from old folktales and stories my dad used to tell me. Historical events are inspiring as are current events. I grew up in the country, and I’ve drawn a lot of inspiration from the deep woods, crumbling tobacco barns, and hollows I used to explore as a kid. If you look to a book like Harrow County, which I have coming up from Dark Horse, you’ll see those elements right there on the page. TFQ: Are there any artists you are just dying to work with the future? Cullen: There are many artists I’d love to work with. Chris Samnee, Jason Latour, Chris Mitten, Alan Davis—the list goes on and one.